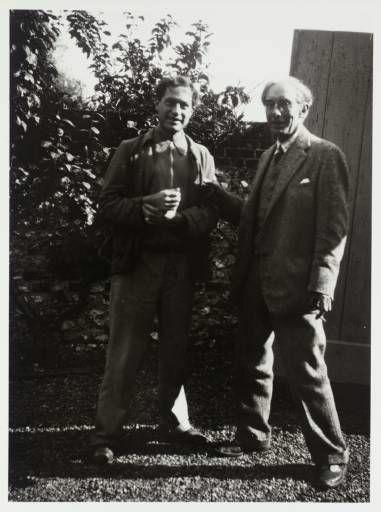 There was one item in the Gift this week which particularly caught our eye, as it documents two different aspects of Duncan Grant’s life as an artist; his creative style and his status as a member of the British art world. 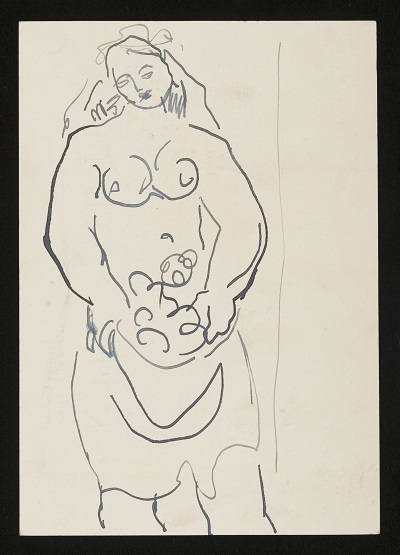 On one side of this postcard-sized piece of cream card is an ink drawing of a bare-breasted woman carrying what appears to be a basket of flowers. While there is no annotation or attribution accompanying the drawing, the classical theme and stylised figure suggest that it was made by Grant, possibly as a study for a decorative scheme. 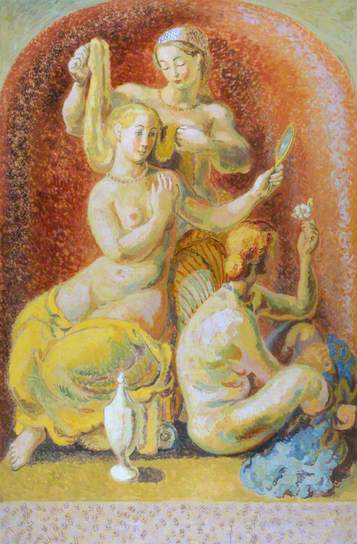 For example, it is reminiscent of the figures in Grant and Bell’s large interior painting of 1929 for Penns in the Rocks, the home of the poet, Lady Dorothy Wellesley. 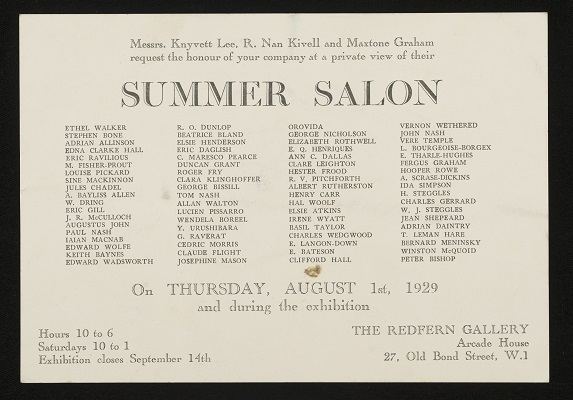 On turning the page, however, we are presented with something entirely different; a invitation to a private view of a Summer Salon, held at the Redfern Gallery in London on the 1st August, 1929. This item documents Grant’s own exhibiting history – he is included as one of the 73 artists in the show – and also provides a glimpse of the British arts scene at a particularly interesting moment in its history. Despite the devastating impact that World War I had imparted upon the arts, the period between the First and Second World Wars witnessed a rich and diverse resurgence of creativity in Britain. While many artists internationally had celebrated modernity and the coming of the machine age at the start of the conflict in 1914, the horrors of war – witnessed first hand by many practitioners who served in the armed forces – provoked widespread reaction against such development. Instead of celebrating progress, many artists returned to more timeless subject matter after the war and employed traditional techniques in their work. While some have argued that this widespread attempt by artists to distance themselves and their work from the conflict led to a tendency towards escapism and nostalgia in the 1920s, it is possible to argue that this particular climate provided fertile ground for practitioners who captured in their work a snapshot of their lives, concerns, and preoccupations – both creative and personal – at an uneasy time in their country’s history. By the 1930s, British artists began experimenting and engaging once again with progressive forms of representation, such as Surrealism and abstraction. This move away from the ‘safe’ traditions employed by artists in the 1920s to an idealistic, modernist aesthetic was in stark contrast to the realities of post-war Britain; an era characterised by the Great Depression, economic instability following the war, and anxiety over the rise of radical political movements such as Fascism and Communism. Hosted at the threshold of the new decade and only weeks before the Wall Street Crash at the end of October of 1929, the exhibition at the Redfern Gallery would have presented visitors with a showcase of artists’ varied responses to this turbulent moment in the country’s history. London Herald, Friday 25th October, 1929. Exhibiting in the show alongside Grant were a diverse collection of artists; some barely known today, others household names. Notable artists include Augustus John, Paul and John Nash, Eric Ravilious, Roger Fry, Lucien Pissarro, Eric Gill, Dame Ethel Walker and Edward Wolfe. This long list of exhibitors is particularly interesting due to the numerous groups and exhibiting societies that the artists were associated with, many of which employing very different aesthetic styles, mediums and concerns. Groups included the New English Art Club (Stephen Bone, Augustus John); the Camden Town Group (Adrian Allinson, Lucien Pissarro, Augustus John, Duncan Grant), The London Group (Edward Wolfe, Roger Fry, Duncan Grant, R. O. Dunlop, John Nash, Allan Walton, Adrian Allinson); The East London Group (Walter and Harold Steggles); The Seven and Five Society (Cedric Morris, Claude Flight); and members of the Arts and Crafts movement (Eric Gill, Gwen Raverat). These various groups were not set in stone, and a number of artists transitioned between them or were joint members at different points in their careers. Artists who were not associated with any group in particular were also included in the show, such as the notable female artists Ethel Walker, Vere Temple and Orovida (Lucien Pissarro’s daughter). While the majority of the artists whose work was exhibited were British, there were a number of foreign practitioners included too, thereby demonstrating the exhibition’s diversity. 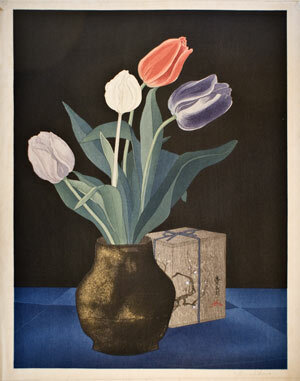 One of the most interesting inclusions is the Japanese woodcut artist, Yoshijiro Urushibara. Having travelled to London with a group of Japanese woodcut artists employed to demonstrate their practice at the Anglo-Japanese Exhibition held at White City in 1910, Urushibara returned to Britain in 1912 when he was hired as a print restorer at the British Museum. While his own work was well received and included in a number of exhibitions and published folios until his death in the 1950s, Urushibara remains largely unknown today. The 1929 show was also notable for another group of now largely unknown painters, the East London Group. Formed in the late 1920s in the East End of London, the group was led by art teacher John Cooper, and included members such as Walter and Harold Steggles, Elwin Hawthorn, William Coldstram, Walter Richard Sickert and Henry Silk. 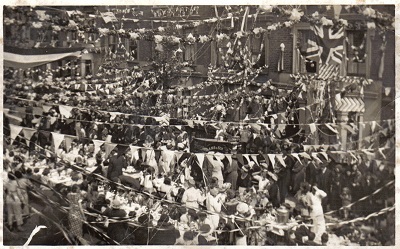 Their works depicted the life and landscapes of the East End of the city, described by one contemporary commentator to capture, ‘the very spirit of the Cockney, the happy robust soul who is England’. The Redfern Salon was one of the first times the group’s works were exhibited, and its members went on to receive notable acclaim from the press throughout the 1930s. Despite this, however, the group has largely faded into obscurity, even to art historians. Walter Steggles. ‘Bow Bridge’, date unknown. Oil on canvas, 46 x 61 cm © The estate of the artist. While the invitation to the private view was used by Grant as a scrap of paper for a quick drawing, and therefore included in the Angelica Garnett Gift as an original artwork, its status as a historical document of a particular moment in British art history is of equal, if not heightened, significance as Grant’s drawing itself. This relatively short blog post is therefore testament to the treasures that have been found so far in the Angelica Garnett Gift; to the multifaceted readings and rich research opportunities available when cataloguing this fascinating archive of objects up in the attic here at Charleston. Read more about the East London Group here and here. You can also follow the East London Group Twitter and Facebook pages. Today is the anniversary of VE Day, marking seventy years since the end of World War II in Europe. This momentous occasion will be commemorated with events all over the United Kingdom. 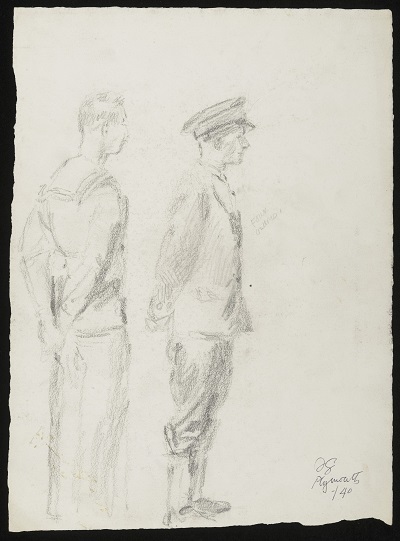 The Angelica Garnett Gift has recently unearthed a number of sketches featuring naval officers in Plymouth, and today seemed the perfect time to share these works by Duncan Grant. 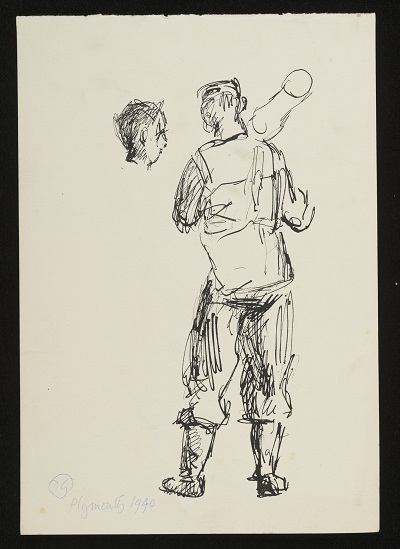 These drawings offer insight into Grant’s occupation during the war and also allow an opportunity to reflect on Charleston and what VE Day meant to its residents. Grant had been approached by the War Artists Advisory Committee in March 1940 and following discussion he agreed to travel to Plymouth and work on producing naval studies. In return for his commitment Grant would receive a wage of one pound a day plus travelling expenses and worked under the condition that he would submit all sketches and finished works for censorship. He lived and worked in Plymouth for two weeks and whilst there met with John Nash, who was working as an official war artist. 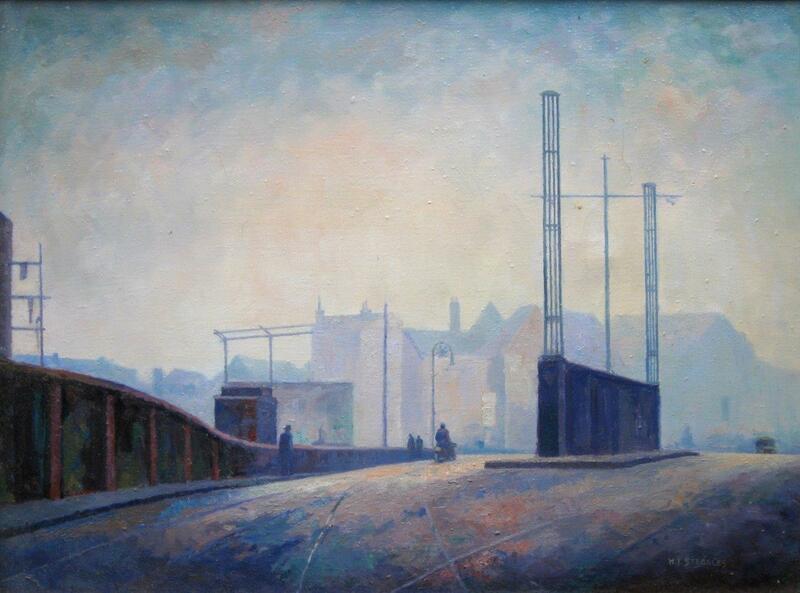 Nash warned Grant that ‘spy mania’ was rife in the docklands and that it would be impossible to paint in that area without constant interruption. Following Nash’s advice Grant chose to depict sailors undertaking gunnery lessons in the naval barracks, and it is the sketches of these observations that we have found as part of the Angelica Garnett Gift. 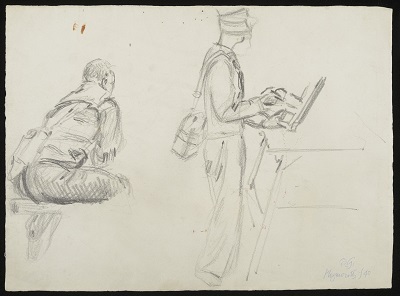 Other preliminary sketches and the final finished work depicting Grant’s time recording the working lives of sailors in Plymouth are in the collections at the Imperial War Museum.